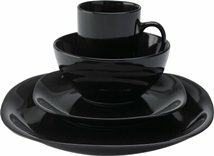 Using black dinnerware to create table settings can be an awesome experience. Neutral colors, such as black or white dinnerware sets, as well as black and white dinnerware can really open the possibilities of making each table setting original, creative and totally unique. These dishes can mixed with other colors to create the ambiance that you desire. A basic set of dinnerware can be used in various ways to make your table look spectacular. From romantic dinners to down-to-earth home cooking experiences this dinnerware can be dressed up or down for a casual setting, but overall it is very much seen as modern dinnerware. A black dinnerware set can be accompanied by red glassware to create an extremely romantic setting. Add some goblets , candlesticks , lace table accessories , or romantic place mats , and some flowers and your table setting will be complete. Of course dinner music adds to the ambiance and can set mood for a romantic dinner for two. There are many black and white dinnerware sets in various types, shapes and materials. 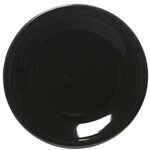 From casual dinnerware sets to fine china patterns, black and white dinnerware is very versatile. It makes total sense to me to purchase two identical dinnerware sets, one in black and the other in white. That will give you to option to use one color or the other or to mix and match for a unique table setting. You can alter the place settings for every other seat. For instance, at one place there will be a black dinner plate, a white salad plate and a black desert bowl, with alternate place setting being the opposite. White dinnerware sets and black dinnerware set are perfect for mixing and matching or for accompanying other colors. They are also ideal for creating holiday settings.